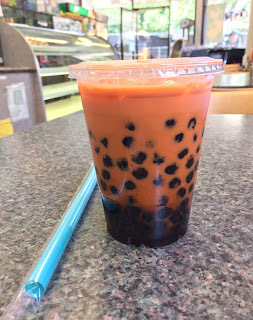 When I had extra time in San Francisco, I looked for bubble tea shops and found a high-reviewed place called "Latte Express" in SoMa (South of Market street). It's a one-story cozy coffee shop with ATM. Not only beverages, but they have some sandwiches, stew/soup dishes and pastries, that last of which were all gone when I was there around 4 PM. A list of boba drinks and sandwiches. I had no idea what "Thai Ice Tea" on the top so I asked one of the staffs and she said, "It's sweet and good!" 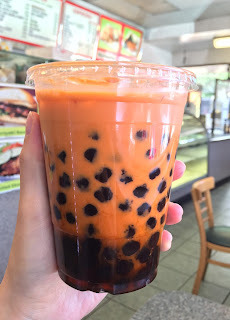 I ordered a cup of Thai Ice Tea and asked her to fill the cup with 90% of boba. She and her colleague looked surprised and asked me, "90%!?!?" Of course I said yes and they even checked with me if the boba they're pouring to the cup were enough. I think in total they put 3 additional cups of boba. Lots of black tapioca in the cup, mostly sunk at the bottom at the bottom and piling up each other. Thai Ice Tea had sweet scent and it's never-seen orange tea. The flavor was different from ordinary milk tea because it had rich sweet flavor close to condensed milk, and aftertaste had referring bitterness. 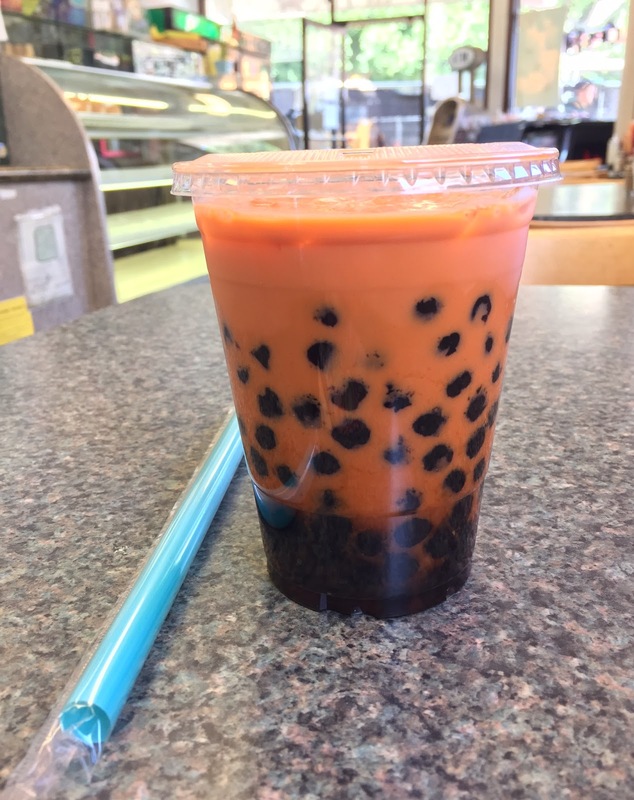 Boba was chewy with slightly firm center. I searched what Thai Ice Tea was and I learned that it's a strongly brewed black milk tea and sweetened with sugar and condensed milk. Depends on the shops, they add spices like orange blossom, star anise and cinnamon, and the characteristic orange color is made with tamarind or food coloring. This Thai Ice Tea didn't have any strong spice flavor and was an easy-to-drink tea. I enjoyed the lots of bubbles to the full extent, but here comes the problem. As there're so many bubbles yet so little beverage as I wished, the drink tends to disappear but the boba is left in the cup. At the end, I was moving the straw around to vacuum all the leftover bubbles into my stomach. The staffs were kind, talkative, and helpful, and the tea was good, too. * Minimum 5 dollars to use credit cards.